The educational movement of STEAM is about bringing Arts at the heart of the academic curriculum in order to cultivate creative skills of young people, alongside with the knowledge and skills they acquire in STEM fields (Science, Technology, Engineering and Mathematics). New demands raised by the global economic environment and the industry for innovation, adaptability, and flexibility highlight the need for cross-disciplinarily connected skills in the educational process, such as creativity, critical thinking, innovation and risk taking, which are expected to foster innovation and economic growth. 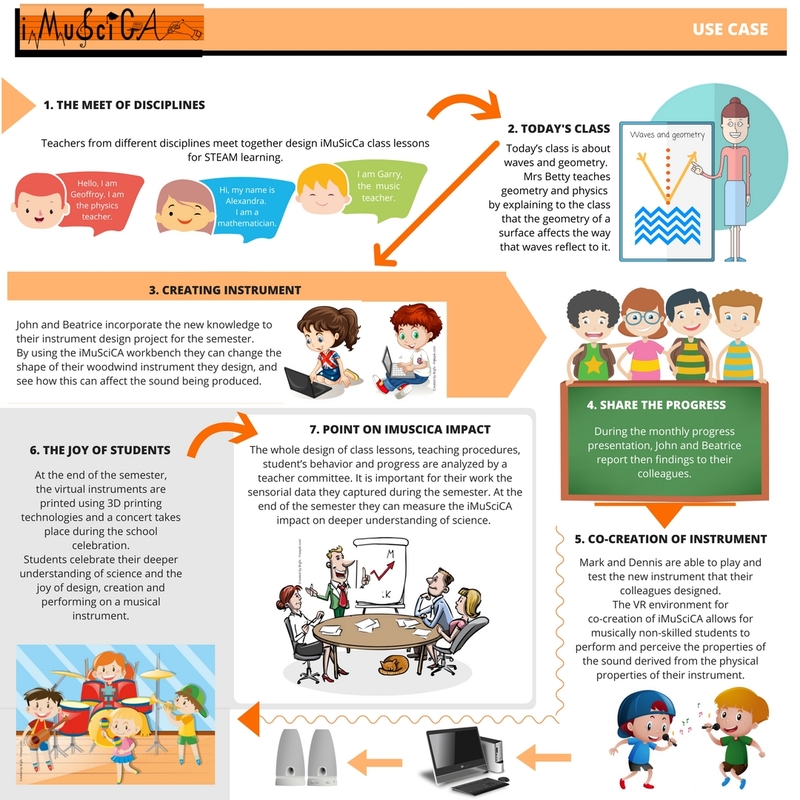 The iMuSciCA project will directly address the current requirements in education and learning for new pedagogical methodologies and innovative educational technology tools by supporting active, discovery-based, personalized, and more engaging learning and providing students and teachers with opportunities for collaboration, co-creation and collective knowledge building. As a STEAM-oriented project, iMuSciCA aims to design and implement a suite of software tools and services on top of new enabling technologies integrated on a platform that will deliver interactive music activities for teaching/learning STEM. Enabling technologies, such as interactive pen on touchpad, 3D object design and printing, as well as new multimodal interfaces that combine advanced music generation and processing with wearable technology, will be deployed to implement a web-based workbench aiming at STEAM learning. The iMuSciCA workbench addresses secondary school students with the aim to support mastery of core academic content on STEM subjects (Physics, Geometry, Mathematics, and Technology) alongside with the development of creativity and deeper learning skills through their engagement in music activities. iMuSciCA stands for Interactive Music Science Collaborative Activities.